This undated photo provided by PepsiCo shows self-driving robots made by Robby Technologies. PepsiCo says it will start making snack deliveries with the robots on Thursday, Jan. 3, 2019, at the University of the Pacific in Stockton, Calif. Students will be able to order Baked Lay's, SunChips or Bubly sparkling water on an app, and then meet the six-wheeled robot at more than 50 locations on campus. The chip and beverage maker says it will start making deliveries with self-driving robots on Thursday at the University of the Pacific in Stockton, California. 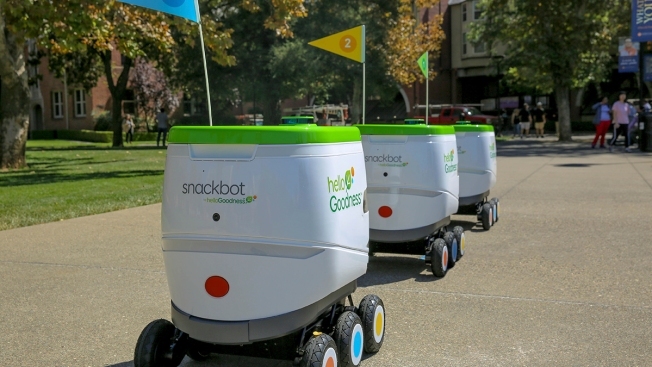 Students will be able to order Baked Lay's, SunChips or Bubly sparkling water on an app, and then meet the six-wheeled robot at more than 50 locations on campus. At first, three robots will be used, but then grow to a fleet of five over time. The robots, which weigh 80 pounds and are less than 3 feet tall, drive on their own and stop when someone is in front of it, Robby says. PepsiCo says it's testing this way to deliver its snacks because more of its customers want a convenient way to buy them on their phones.